Potty training is in full swing! Ted has been doing so well and with it being a bank holiday we thought it was best to make the most of 4 days with us all at home to finally crack it. We did attempt to get him to use the toilet and scrap potty's altogether but it didn't feel right for him so a potty in the living room is what we settled on. We decided to leave him without anything on his bottom half so that he could feel when he needed to go. Last week I tried him with the potty training pants from the Asda Little Angels Range. He liked them but they made him feel like he still had a nappy on and he was happy to wee in them rather than head for the potty. We want to keep them on hand though for car journeys and short trips 'just in case'. Since having his nappy off this morning we have had both a wee and a poo in the potty without having to prompt him. Of course we checked every 15 minutes or so to remind him and see if he was ready but when he felt he needed to go off he popped and called us when he was done. He is so happy with himself and we take him to the toilet so that he can flush it away himself! A Potty - Of course, unless you plan to use the toilet in which case a toilet seat (specially for toddlers) and a stool will be perfect. We got our stool from Ikea and the seat from the Aldi Specialbuys. Potty Training Pants - Should you decide to use these, as mentioned before we just have them for car journeys etc. Bed mats - These go under the sheets for added protection at night time. We actually used these before Ted started potty training in case his nappy ever leaked. Spare pants and trousers - Once you have reached the stage where your toddler is ready to wear pants you might find there are still accidents. Keep a stock of pants and trousers close by and plenty in their nursery bag too! 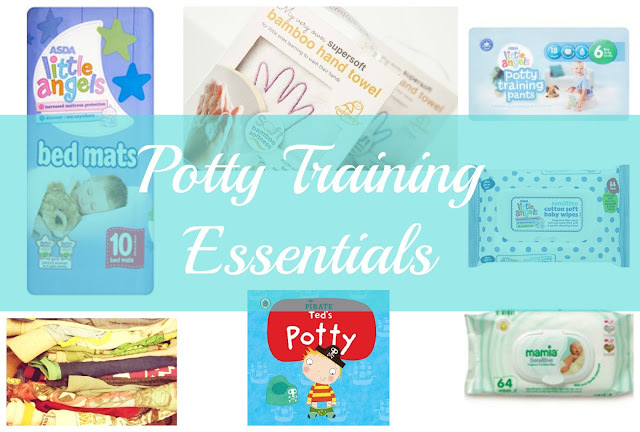 Potty Training Books - It really does help for a child to be able to visualise the potty training process and how it works. Our Pirate Ted's Potty book was brilliant and helped Ted to get excited about learning to use the potty. Wipes - Toilet roll isn't the easiest thing to use with potty training, there are a huge amount of specialist toilet wipes on the market but why waste your money. Keep your regular wipes to hand for teaching them the 'front to back' technique and you will need them for those times when they don't quite make it and operation clean up is needed! We usually use the Aldi Mamia wipes because that is where we shop on a weekly basis but I actually like the Asda Little Angels wipes which have recently been supported by Mumsnet and are just as good. Hand Towel and Soap - For good hygiene it makes sense to train your child to wash their own hands after using the potty. Making hand washing an important part of daily routine can be a fun thing for a toddler. We got Ted some special fun hand wash which is Bubblegum scented and I am off to get a Palmolive Aquarium bottle soon with a little turtle in which he will love. The Cuddledry Bamboo Hand Towel is a lovely little gift to make your toddler feel special and you can rest assured it is soft on their skin and antibacterial. We will be featuring a full review on the blog this week! Finally one thing that is definitely needed is time and patience. This could take anything from a few days to a few months to get into a routine but keep at it and always remember to praise your child, they will be so pleased with themselves knowing you are proud of what they have achieved.